Oculus Finds A Fix For "Simulation Sickness"
Oculus Rift's CEO talks about how to avoid puking with VR goggles on. Every new stage of immersive entertainment has various issues to overcome. While 2D games are pretty simple to process, 3D graphics, especially in first-person, take some exposure to get used to. The body can often react violently when what it sees and what it feels don't match up. VR tech, like the Oculus Rift, has the potential to really mess with the mind in whole new ways. Oculus CEO Brendan Iribe admits that even he gets sick strapping the goggles to his head, something they call "simulation sickness", but they think they know how to fix it. "I've gotten sick every time I've tried it. Every time until recently," Iribe said at the Gaming Insider's conference in San Francisco. "In the last few weeks, I stayed in it for 45 minute sessions and I did not get sick with the new prototype. We are at the edge of bringing you no motion sickness content." The remedy involves overcoming a host of hardware challenges. Resolution, latency, persistence, field of view, and judder all play a part in making sure you keep your lunch down. Iribe thinks that overcoming that hurdle isn't just important for Oculus, but for the entire medium. In his talk, he compared it to John Carmack's original Doom engine. It wasn't perfect, but it was an important leap forward for 3D engine technology. 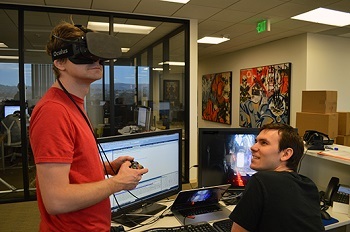 The comparison's particularly interesting, as Carmack's now working full-time at Oculus. Once simulation sickness gets ironed out, Iribe predicts that the Oculus Rift could be used as a general-purpose "IMAX viewer", not just a gimmick. "This is day zero. We are at the very beginning of VR," Iribe said. "This is the future of gaming as we see it.